One of the biggest complaints that many homeowners have is high energy bills, especially during the cold months of winter and the hot months of summer. Many of those same homeowners feel like there isn’t anything they can do about their high utility payments, but that’s simply not true for many people. 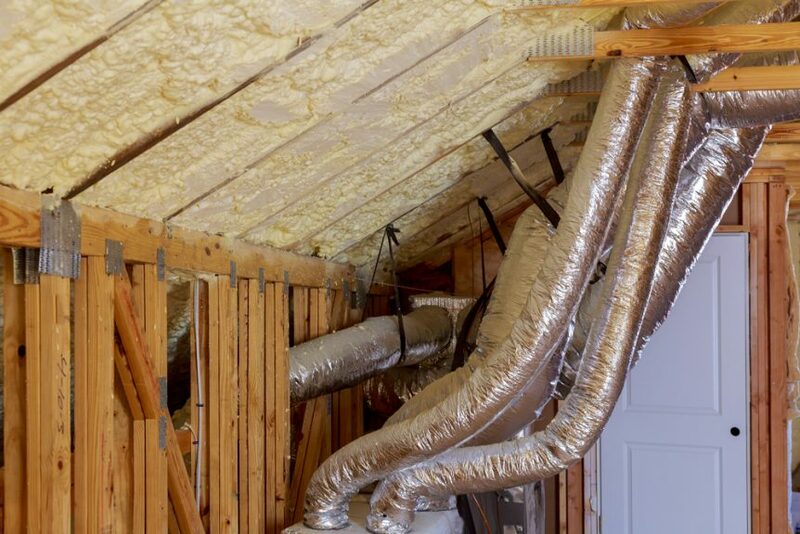 Often, two of the key contributors to high energy bills are poor attic ventilation and an inefficiently sealed HVAC (heating/ventilation/air conditioning) system. If this is true in your home, you’re in luck. There are two key ways that you can decrease your energy bill and increase your comfort level at the same time — even during the height of the hot or cold season. Let’s begin at the top of your house. Proper attic ventilation is a key contributor to maintaining a comfortable temperature in your home without breaking the bank. Most homes are designed to allow air to enter the attic space beneath the eaves and escape through vents installed along the ridge of the roof. Unfortunately, many attics end up with clogged eave vents after attic insulation has been installed. These plugged vents can lead to attic temperatures of nearly 150 degrees, sometimes even higher. Temperatures like this can be both dangerous and detrimental to your energy bill costs. In addition to high attic temperatures, improper attic ventilation can also trap moisture in your attic, leading to the possibility of mold or rot attacking your home. If your home does have blocked or clogged vents in the attic, you will want to work toward restoring proper attic ventilation. Thankfully, the key to restoring proper attic ventilation is relatively simple. The vents along your eaves will need to be cleaned out, which may include moving, shifting, or working around the insulation that has been installed in your attic. Once the vents are accessible, baffles can be installed to help keep those opening clear and direct air through your attic, helping to maintain comfortable, safe temperatures in your home. The other common culprit in high energy bills that we wanted to talk about today, inefficiently sealed HVAC systems, is a little less centralized and, therefore, a little bit tougher to take care of. In many HVAC systems — especially forced-air heating and cooling systems — ducts are used to distribute heated or cooled air throughout your home. Most of the time, these ducts are made of flexible metal material. Many other HVAC elements are made of sheet metal, and the connections between these different elements and the ductwork are frequently not properly sealed. In addition to allowing heated or cooled air to escape, these unsealed or improperly sealed areas can lead to poor air pressure and circulation throughout your home. Sealing these areas can improve your HVAC system efficiency, which means lower costs for your heating and cooling needs. It will also typically help to prevent some dust from entering your home. Nobody wants to pay high energy bills, but nobody wants to come home to a cold home in the winter or a hot home in the summer, either. That’s why you installed an HVAC system in the first place (or bought a home that already had one), right? So why not make sure that you can be comfortable all year round by making a few simple improvements around your home? As a homeowner, these types of improvements and their upkeep are an incredibly important part of making sure that you and your family can enjoy your home all year round. Both attic ventilation and duct sealing can be somewhat time consuming projects, and they may cost you some money up front. But both of these simple tasks can help you save hundreds or even thousands of dollars every year on your energy bills.